Researchers at the University of California, San Diego School of Medicine have completed the first comprehensive survey of e-cigarettes for sale online and the results, they believe, underscore the complexity in regulating the rapidly growing market for the electronic nicotine delivery devices. The survey, published in a June 16 special supplement of the journal Tobacco Control, found that 10 new e-cigarette brands entered the Internet marketplace every month, on average, from 2012 to 2014, and that there are currently 466 e-cigarette brands online, offering more than 7,700 flavors, including candy flavors such as gummy bear and marshmallow, that may appeal to children. In contrast, traditional cigarettes sold in the United States can be marketed in just two flavors: tobacco and menthol. The scientists also documented a shift in the marketing of e-cigarettes, with newer brands selling customizable e-cigarettes that might look nothing like an old-fashioned tobacco cigarette. For example, some resemble pens, flashlights, even a violin. The marketing messages also change with the products: Older brands were more likely to claim that e-cigarettes were healthier or cheaper than smoking, or that e-cigarettes could help people quit smoking. Newer brands are less inclined to making these claims. Instead, their marketing is focused on consumer choice, such as flavors or models. “It almost seems that newer brands don't want to be compared to cigarettes, which are associated with the image of cancer," said lead author Shu-Hong Zhu, PhD, professor of Family and Preventive Medicine and director of the Center for Research and Interventions in Tobacco Control at UC San Diego. Smoking-related diseases are the leading cause of preventable death worldwide, estimated to be responsible for 6 million deaths annually. Although smoking rates among American adults have declined by more than half, from 42 percent in 1965 to 18 percent in 2012, tobacco use in the United States is still responsible for nearly one in five deaths, according to the American Cancer Society. 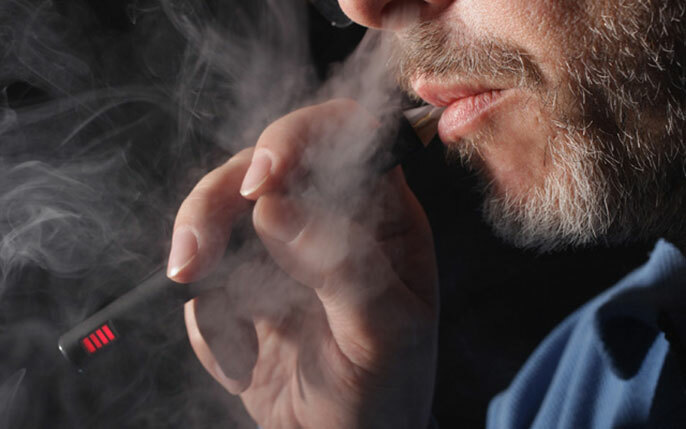 E-cigarettes vaporize nicotine, the addictive ingredient in tobacco products. They first became available in the U.S. in 2007 and have since stoked controversy about whether they improve or worsen public health by reducing tobacco cigarette consumption or provide an alternative way to consume nicotine. “Some consider them promising products to help smokers quit traditional cigarettes, while others believe they will re-normalize smoking, which will keep more people smoking,” Zhu said. Although the authors support the Food and Drug Administration’s proposed rules that e-cigarette companies be required to list ingredients and nicotine strengths, follow good manufacturing practices to ensure product safety, require child proof e-liquid containers and ban sale to minors, they caution that overly stringent regulations could have unintended consequences. Regulations would likely favor brands with strong financial backing and most of these would be owned by tobacco companies. “Obviously, tobacco companies would be more concerned with protecting cigarette market share than smaller e-cigarette companies,” Zhu said. Too many regulations run the risk of changing only the market share of different e-cigarette brands rather than reducing the prevalence of smoking, he said. The most important goal in e-cigarette regulation should be to reduce the number of people smoking cigarettes. Cigarettes are the most deadly tobacco product, killing half its users. Co-authors include Jessica Sun, Erika Bonnevie, Sharon Cummins, Anthony Gamst, Lu Yin and Madeleine Lee, UC San Diego Moores Cancer Center. Funding for the study came from the National Cancer Institute under the State and Community Tobacco Control Initiative (grant UO1-CA154280).